As news articles and reports regarding food prices, ethanol use and grain stock supplies appear with greater frequency, the U.S. Department of Agriculture released two important reports on Friday that shed additional light on supply and demand estimates for important agricultural commodities. In addition, the USDA numbers provide a firm foundation for assessing some aspects of the agricultural economy as policy makers consider changes to U.S. farm policy. (Illinois Corn Harvest, FarmPolicy Photo). For historic context with respect to corn production, see this graph; for soybean production, just click here. Also Friday, the World Agricultural Outlook Board (WAOB) released the monthly World Agricultural Supply and Demand Estimates (WASDE) report, which included additional use and current supply estimates for key program crops. For a broader look at past and potential future corn stock levels, see this USDA graph. For reference to historic price levels of corn, see this graph. 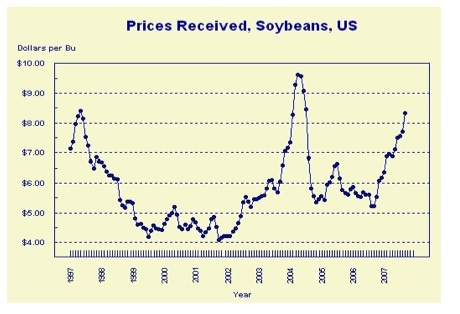 For reference to historic price levels of soybeans, see this graph. 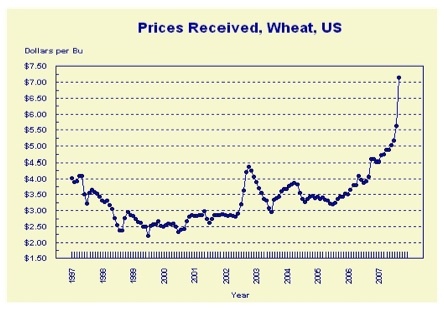 For reference to historic price levels of wheat, see this graph. The audio interview report lasts about 17 minutes. Meanwhile, Reuters writer Nigel Hunt reported on Friday that, “Wheat is likely to be grown on much of the land returning to agricultural use this year after record prices for the commodity led the European Union to ditch rules keeping land out of production. ‘I think the main focus will certainly be on using set-aside for wheat production because of the remarkably high wheat prices we have seen in past months,’ one German analyst said. “EU agriculture ministers agreed on Sept. 26 to end a rule that farmers leave 10 percent of their land fallow, known as set-aside, in a bid to increase grain supply after shrinking stocks sparked a sharp rise in wheat prices. “The rule was introduced in early 1990s as the EU sought to reduce its grain mountains. And Philip Brasher, writing in Saturday’s Des Moines Register, provided an excellent narrative recap of some of the more important numbers contained in Friday’s USDA reports. Mr. Brasher stated that, “The slowdown in the ethanol industry is taking some pressure off the nation’s corn supplies. “For the second straight month, the U.S. Agriculture Department on Friday trimmed by 100 million bushels its estimate of how much of this year’s corn harvest would be converted into fuel ethanol. That’s the amount of grain that would be used in a year by three to six typical distilleries in Iowa. The Register article also pointed out that, “Export sales commitments are running well ahead of the pace on last year’s harvest, said Joe Victor of Allendale Inc., a commodity research firm in McHenry, Ill.
“With the world population growing, ‘we’re putting more stress on grain and oilseeds to perform for feed and fuel and human food consumption,’ he said. And with respect to oil prices, another variable that has an important impact on food prices, Matt Chambers, in an article posted at The Wall Street Journal Online, reported that, “Crude-oil futures settled at an exchange record Friday after gaining for the fourth straight session on concerns that there will be a big shortfall in supplies going into the Northern Hemisphere this winter.